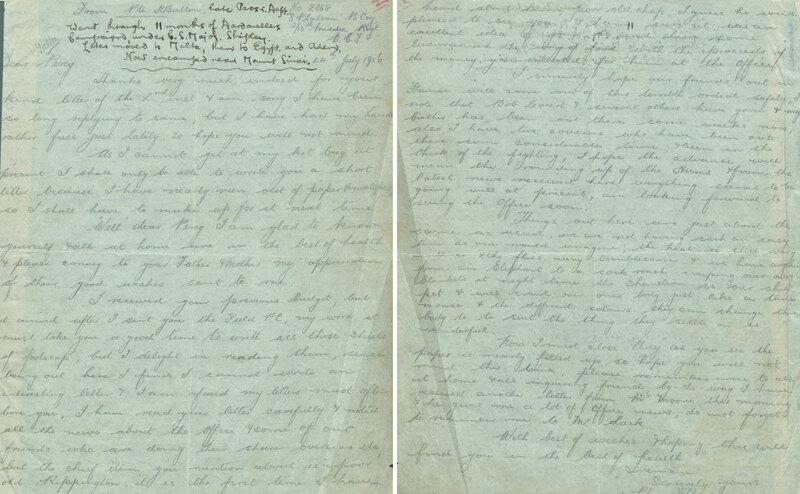 An employee at the Audit office added the following note at the top of the letter: Private H. Bullen, late of the Passengers dept, went through 11 months of Dardanelles campaign… Later moved to Malta, then to Egypt and Aden. Now encamped near Mount Sinai. …I am sorry I have been so long replying to your letter, but I have had my hands rather full just lately, so hope you will not mind. As I cannot get at my kit bag at present I shall only be able to write you a short letter because I have nearly run out of paper envelopes, so I shall have to make up for it next time. Well my dear Percy I am glad to know yourself and all at home are in the best of health and please convey to your father and mother my appreciation of their good wishes sent to me. I received your previous budget, but it arrived after I sent you the field postcard, my word it must take you a good time to write all those sheets of foolscap, but I delight in reading them, since being out here I find I cannot write an interesting letter. I am afraid my letters must often bore you, I have read your letter carefully and noted all the news about the office and some of our friends who are doing their share overseas, but the chief item you mention is poor old Rippington, it is the first time I have heard about him, poor old chap. I guess he was pleased to see you and I am sure it was an excellent idea of yours to send him some luxuries in the way of food with the proceeds of the money you collected for him at the office. We are not having such an easy time as one would imagine, the heat is still very intense and the flies very troublesome and we have anything from an elephant to a cockroach creeping over our blankets at night time; the chameleon is our chief pet and will crawl over one’s body just like a tame mouse and the different colours they can change their body to suit the thing they settle on is wonderful.